We don’t actually have a television here on Nocturne. The humans have a TV screen and they enjoy watching films and TV series on it (we also use this screen for the computer) but we don’t watch any actual TV. I’m happy for them to watch what they like as long as it doesn’t interfere with my fish TV. Thier viewing enjoyment isn’t set to a schedule since we have everything stored on our hard-drives (or they watch YouTube) so they can watch it at anytime. Fish TV however has a schedule… It varies depending on the day obviously, but I always know the best time to go outside and watch it. The humans aren’t as in tune as I am though, so I often have to stop them watching their program so we don’t miss the live fish programs! I don’t think I’ll ever get bored of fish TV – it’s one of the best things about living on a boat! I also enjoy bird TV of course but with the strong winds we’ve been having recently the little acrobatic birds have been taking a break. I can always rely on fish TV though! I spend about half an hour everyday watching. I’ve heard that watching human TV can give you square eyes… I hope that fish TV won’t give me scales! « Harringtons give pawesome prizes! I watch Big Brother cause there is a “Cody” on there MOL!! In all seriousness, I would much rather watch “Fish TV” like you! 😉 trust me Brofur Bailey ya NOTT get scalez on yer eyez frum watchin da fishiez!!! Me watchez live Sparrow TV n live Pidjun TV when me outside. When me inside wif Mum, me watchez “Poirot” da Belgeeum Deetective n Bollywood moviez n “Heartbeat” frum da UK n NASCAR zoom zoom zoom racez….Oh n we watched ALOT of showz on Sahak week so me watched da B-I-G fishiez, MOL!!!! We are three indoor-only kitties who live in Boca Raton, Florida, USA. We have several channels of tv from which to choose: Muscovy (Duck) TV, Lizard TV, and Watch The Humans Put Away The Groceries TV (our favorite). Hi Bailey, It’s so cool you have fish TV. We have live mice TV….my favourite. Kali’s fave is bird TV. We both agree that Nip TV is the bestest. 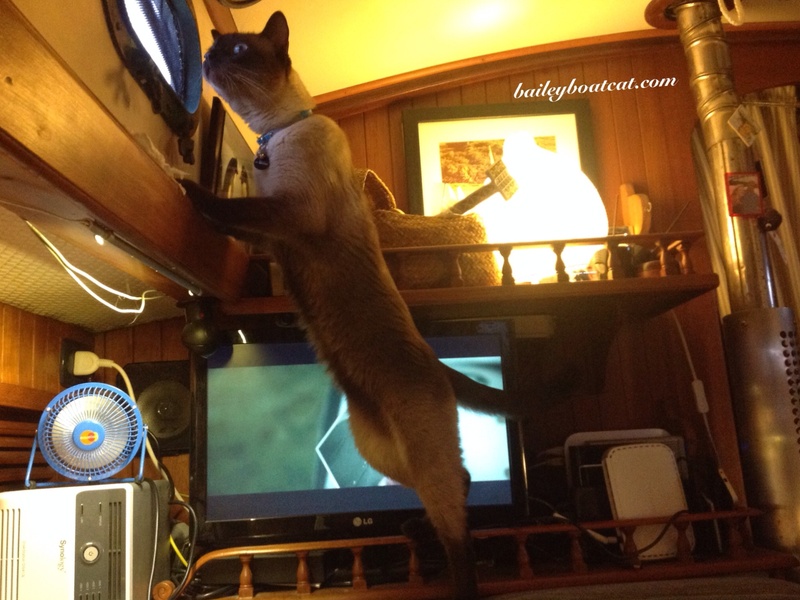 How fun that you get to have Fish TV, Bailey! That’s something few cats can get. That fish tv sounds pawsome, dude! Enjoy! I’d luv some Fish TV. Does it include fish dinner? Well, that’s one channel we never get! 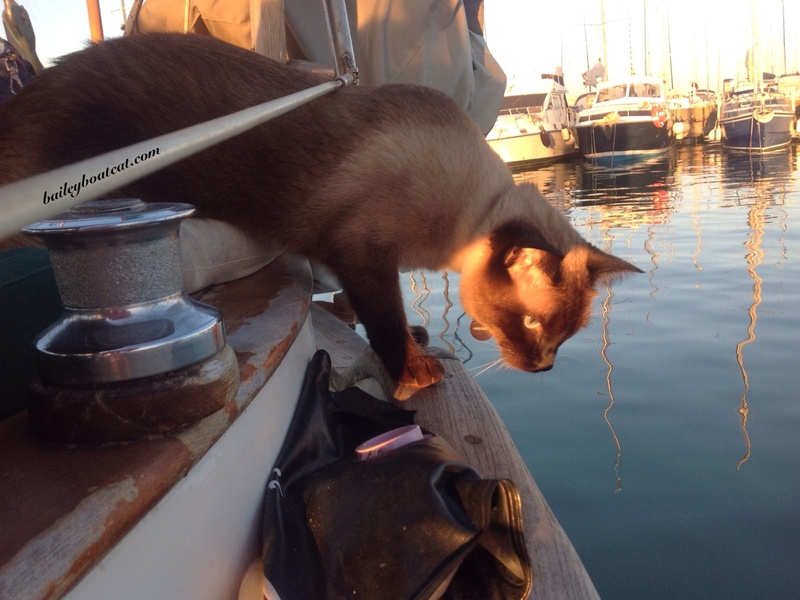 Bailey Boat Cat, I love reading about your adventures. My human Mom thinks I look a lot like you, but I’m a seal tortie point siamese. I would love to meet you. That is one great channel! Mom really likes that wide eye “hey I am going to miss this!” look. I only watch TV is there is a tennis match on. I love that little yellow ball. Bailey, your TV sounds more interesting than lots of what we humans watch! Truth be told, I’m a “British Invasion” junkie, and love all the mysteries and detective series, as well as the HUGE Downton Abbey. Imagine what YOU’D do in a house that size!! if anyone can pull off scales its you! I love your subtle hint to your folks they should stop watching boring tv and watch fish tv instead! 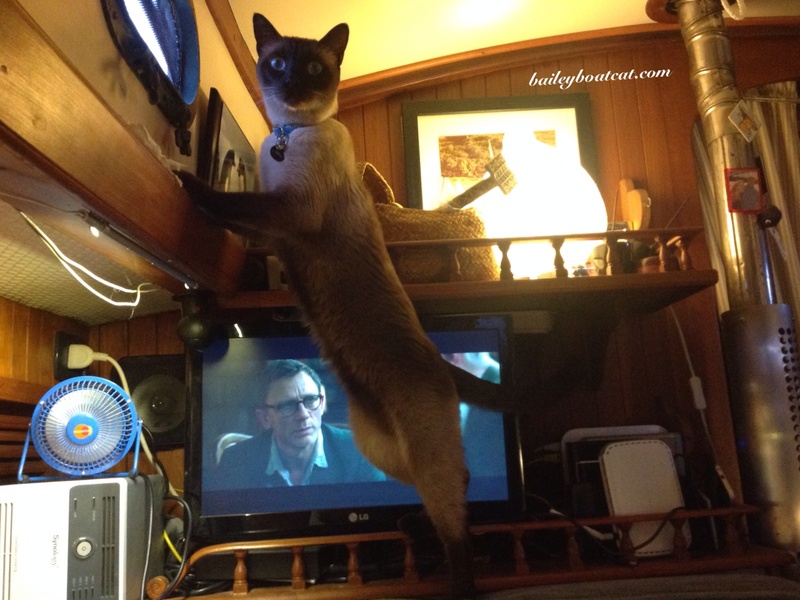 No worries Bailey – I’m sure you won’t grow scales…..you are, however, very good at keeping an eye on those fish!! I don’t watch TV except for football in the Fall – all those little things running around on the TV screen – looks like bugs and I love bugs! Bailey, I can’t wait to tell Angel and Chucky about your FishTV! They enjoy SquirrelTV. 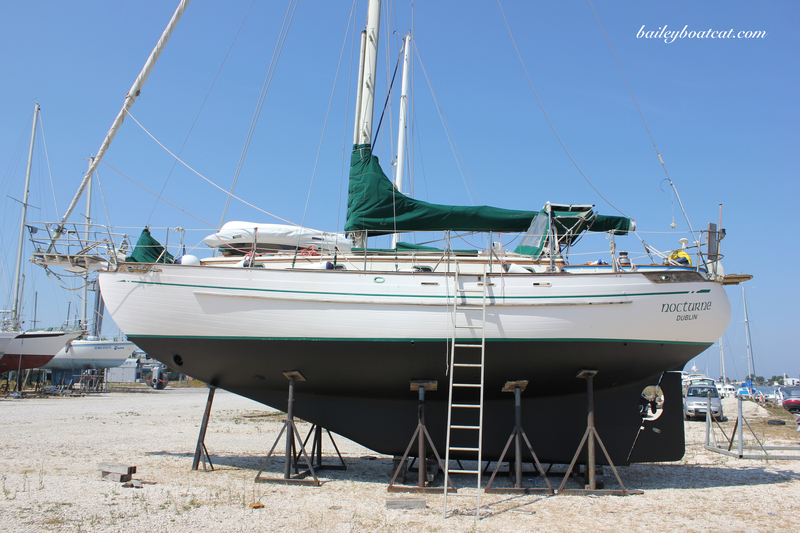 Do you have lots of cobwebs to eat, since you live on the water? Angel eats cobwebs like it’s cotton candy.